Here is a brief story of Mr. Choo Yeok Boon, the first Sino-Siamese to accept the Faith in Malaysia. 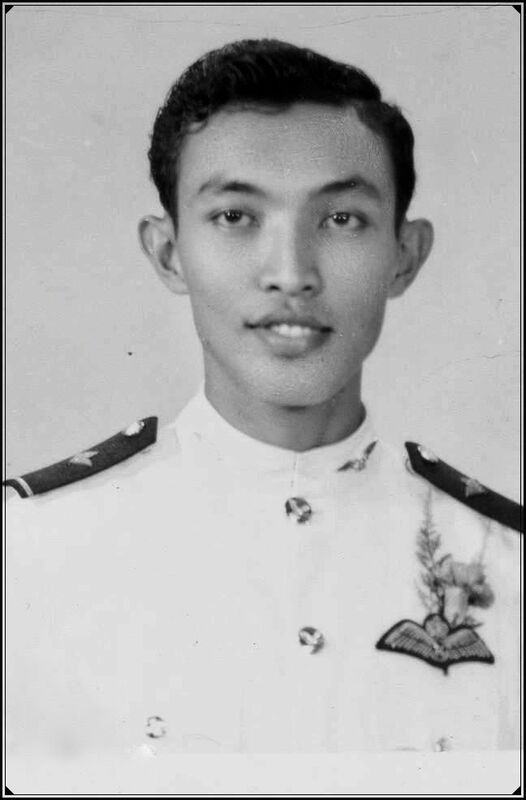 He was the first Bahá’í to have sacrificed his life for the nation during the course of his duty as a Captain in the Royal Malaysian Air Force. Yeok Boon as he came to be called shall always be remembered as one who set an example to the youth by living a chaste and holy life. He was from Naka, Pokok Sena, in the state of Kedah, Malaysia and when he came down to study at the Sultan Abdul Hamid College in Alor Setar, he stayed in one of the huts meant for novice monks at the Telok Wanjah Siamese Temple. He was an active member of the temple. Yeok Boon became a close friend of the Teh family (Teik Chow, Teik Meng, and Teik Hoe). The other classmate he was close to was Yin Hong Shuen. As Yeok Boon was staying close by to the Teh family home in Lorong Merpati, he used to visit them often for meals and fellowship. Yeok Boon studied in the Tunku Abdul Halim Primary School in Kampong Baru, Alor Setar and continued his secondary education in the Sultan Abdul Hamid College in the same town. He first heard of the Faith from Mrs. Theresa Chee in 1963. He used to mix with the Bahá’í students who gathered at the residence of Mr. S. Nagaratnam at 895-B, Sultan Abdul Hamid College Quarters. When Yeok Boon came to understand the essence of the Faith, he fell in love with the Teachings and felt moved to accept the Faith immediately. But he faced a dilemma. His mother Madam Tek d/o Din Nom, herself of a Siamese descent had made a vow that he would become a Buddhist monk. So Yeok Boon was obliged to fulfill his mother’s vow and decided to declare as a Bahá’í a year later. But when he informed her of his decision to become a Bahá’í, he was astonished that she readily embraced the idea. As Yeok Boon would relate later, his mother had had a dream in which a monk had informed her that her son had made the right decision. However, he did not shave his head bald, neither did he become a monk. He was the first from the Sino-Siamese background to have accepted the Faith in Malaysia. The love for the Faith inflamed his soul with such a consuming passion that he loved and served the Cause through sacrificial deeds and an exemplary way of life. Later, Yeok Boon’s mother too accepted the Faith. After accepting the Faith in 1964, he arose to serve the Cause in many exemplary ways. When the National Spiritual Assembly of the Bahá’ís of Malaysia formed a National Bahá’í Youth Council in 1964, Yeok Boon was appointed on to this Council and when he came to study in the Kuala Lumpur Technical College in 1966. Yeok Boon was once again appointed onto this Council the following year. In 1965, Yeok Boon initiated the formation of the first Local Bahá’í Youth Committee in Alor Setar, and with the local youths he went out opening up new areas for the Faith. He also concentrated on introducing the Faith to all he had known in Alor Setar. Teh Teik Cheow and his brothers Teh Teik Meng and Teh Teik Hoe, Tan Keat Fong, Theenathayalu and Lum Weng Chew were among the heroes who were guided directly and indirectly into the Faith by Yeok Boon. First Youth Committee of Alor Star, 1965. Yeok Boon is seated in the centre, with R. Ganasa Murthi to his left. Yin Hong Shuen is standing at extreme right. Yeok Boon had a radiant nature and loved to sing with his Bahá’í colleagues like Chong Boo Haw and Teik Hoe. His favorites were Danny Boy, Jing Kling Nona (a popular campfire song). There was a particular song of Elvis Presley called “Don’t Leave Me Now” that he liked, and he would ask either Boo Haw or Teik Hoe to teach him this song where he would try to impersonate the singing style and moves of Elvis. Yeok Boon picked up singing and later became a lively performer at Bahá’í conferences. 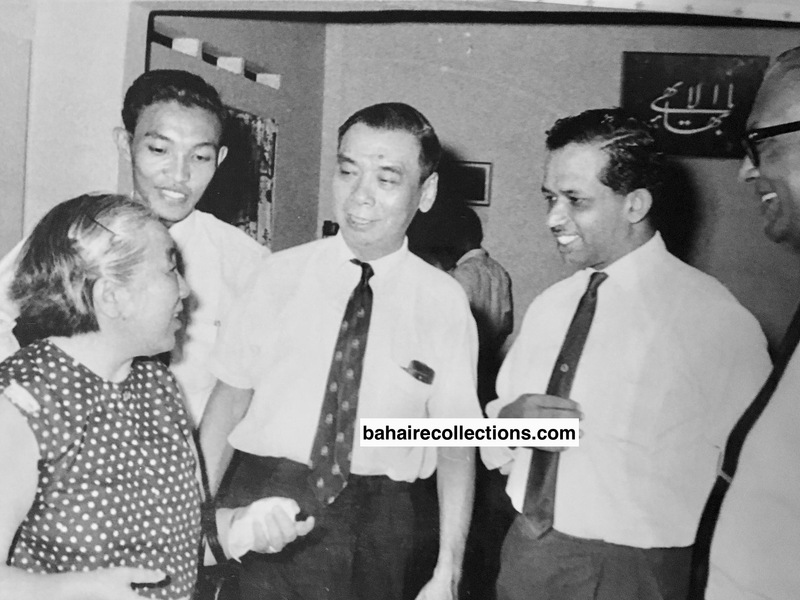 While Yeok Boon moved with everyone in Alor Setar, he, together with Ganasa Murthy Ramasamy and Yin Hong Shuen were called the “Three Musketeers” as they teamed up often to carry out extensive teaching activities. In 1966, Yeok Boon was appointed on to the Border Teaching Committee, but he had to move to Kuala Lumpur the same year to join the Kuala Lumpur Technical College as a Kedah State Scholarship holder. When Yeok Boon came to the College, he was the only Bahá’í among the few hundred students in the College. Yeok Boon made history when he became instrumental in the formation of the first Bahá’í Society known as Technical College Bahá’í Society of Kuala Lumpur. That was the first institution of higher learning to have established a Bahá’í Society. The Bahá’í Society was registered with the College and within the first year, the Society organized two public talks. One was in July 1967 where Mrs Orpha Daugherty, an Auxiliary Board Member from Thailand who came to serve in Malaysia gave a talk while Mr Bijan Bayzayee, an Iranian pioneer to Laos answered questions from the floor. The Society had pinned Bahá’í pamphlets on all the notice boards in the College that no student or visitor to the College could have missed. He made sure that every single student in the college had within a short period, heard of the Faith with his room number 47 functioning as the “operation room.” This society organized several activities including public talks on the Faith including one by Hand of the Cause of God Mr Tarázu’lláh Samandari in January 1967. In the same year, Yeok Boon wrote an article about the Faith in the Annual Report of the college, and since the article was longer than the requirement of the college, he paid for those extra pages. That was possibly the first time an article on the Faith was ever written in any magazine of the college. Yeok Boon also secured a notice board where he displayed many Bahá’í news and photos which became the most attractive of all the notice boards. In 1966 Tan Keat Fong from Alor Star joined the College and Yeok Boon helped him out in the accommodation. Both Keat Fong and Yeok Boon were from Alor Star, but had met only in the Kuala Lumpur Technical College. Through Yeok Boon, Keat Fong accepted the Faith, but he had to leave after three months, and later joined the Malayan Teachers College in Penang to undergo teacher training. At the Malayan Teachers College, Keat Fong formed the Malayan Teachers College Bahai Society. On the encouragement of Yeok Boon, Teh Teik Hoe joined him in the Technical College and he too got the Kedah State Scholarship. By 1967, Yeok Boon had guided several friends into the Faith. Some had accepted during his days in the College while others accepted when he had left. In fact, he brought in the Presidents of the Buddhist Society, the Hindu Society and later the Catholic Society to embrace the Cause of Bahá’u’lláh. This was a unique achievement in the annals of religious society in any higher institutions of learning in Malaysia. Mr A.P. Arumugam who was the President of the Hindu Society later became the President of the Technical College Bahá’í Society. Mr Francis Satkunasingam, President of the Catholic Society who was investigating the Faith embraced the Faith following a book exhibition that the Society organized in August 1968, followed by Mr Jasbir Singh, the Vice President of the Hindu Society. Others who accepted the Faith in the college were Ravichandran, Lye Chye Thiam, Fong Ah Meng @ Fong Aik Meng, Lim Kee San, Chia Ah Siew, Mahendran, A.P. Perumal, Mah King Tok, Saw Kean Thai, and Kelvin Koay Hean Lye. Wong Meng Fook of Penang was studying in the Technical College during Yeok Boon’s time, but he accepted in Penang in 1970. It was Yeok Boon who had planted the seed at a talk organized by the Catholic group of the College. The group of believers in the Technical College were hyperactive in organizing firesides, deepening classes, and book exhibitions. The entire college witnessed the believers observing fasting. It was Ravichandran who would get up at dawn and go over to each hostel block to knock on the doors and wake the believers up to start fasting. They got together in the evening to break the fast too thereby establishing a good community life within the campus. He brought the youth for most of the activities to the National Bahá’í Center in Kuala Lumpur. In 1968, Yeok Boon served as the Secretary of the Local Spiritual Assembly of the Bahá’ís of Kuala Lumpur. 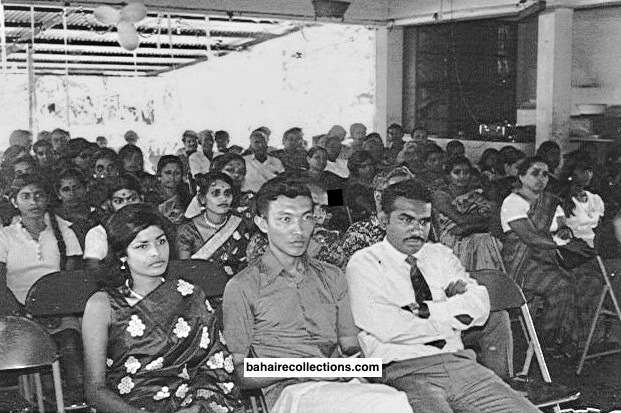 Members of the Kuala Lumpur Technical College Bahá’í Society at the National Bahá’í Center, 1967. Ravichandran is standing at extreme left. Lim Kee San is standing third from left. Choo Yeok Boon is seated at extreme right with A.P. Arumugam next to him. Lye Chye Thiam is seated at extreme left. Even when a student at the Kuala Lumpur Technical College, Yeok Boon was actively involved in several Bahá’í activities across the country. At the Bahá’í Seminar held in Singapore at the end of December 1966, Yeok Boon who was the Chairman of the National Bahá’í Youth Council spoke eloquently in the presence of Hand of the Cause of God Taráz’ulláh Samandari on the subject of “What a Bahá’í Youth Should Aim to Be” based on the guidance from the Guardian especially on “A Chaste and Holy Life”. He also reminded the friends of the statement of ‘Abdu’l-Bahá, “I desire distinction for you” and gave examples of how one could distinguish himself from the generality of mankind. Thereafter, Yeok Boon was almost a permanent speaker in several gatherings to guide the youths. National Bahá’í Center, 1967. L-R: Mrs George Lee, Yeok Boon, Wong Kok Mee, E. Anthony Fernandez. In Kuala Lumpur, 1967. 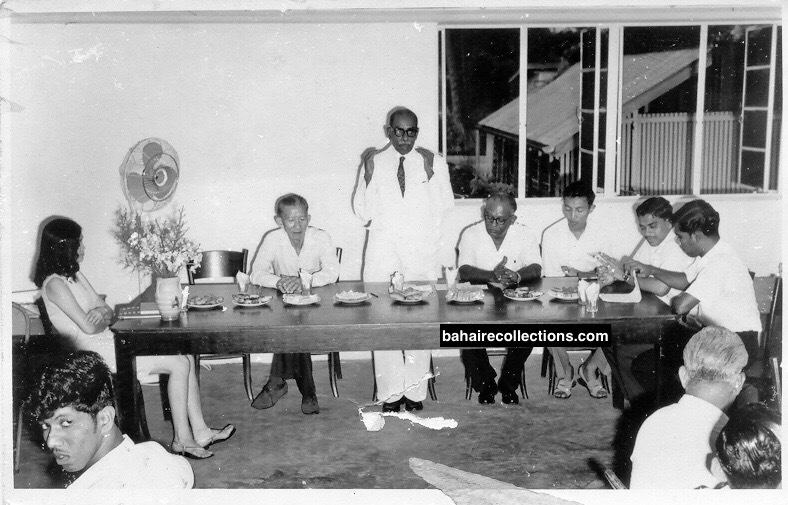 Yeok Boon seated at extreme left with R. K. Kannan next to him. Dr N. Soraya is standing at extreme left with S. Vasudevan, the Secretary of the National Spiritual Assembly next to him. Appu Raman stands at extreme right. Yeok Boon was so active and passionate in teaching the Cause in the College that he neglected his studies. He failed some subjects in his first year and had to repeat that year. He appealed to the Kedah State Scholarship Board for a second chance. Teik Hoe followed him to meet the authority. The Kedah State Scholarship Board gave a listening ear and was willing to allow him to repeat so long as the Principal of College was in agreement. But Mr Navaratnam, the Principal was not willing to consider his appeal on the grounds of his aggressive preaching of the Faith in the campus. When he fell out of the campus, he got a job with a brewery company but decided to leave it as he found that working there was not in line with the tenets of the Faith. And he continued to actively serve the Cause. A landmark event was the Summer School of 1968 held in the Sunshine Camp in Port Dickson. The youth session was a highlight of the Summer School. Mrs Jeanne Frankel from the USA spoke on “Living Rule” in which she listed the duties of Bahá’í youths in showing a new way of life to the outside world and concluded by calling the youths to go pioneering. The National Bahá’í Youth Council had prepared a booklet containing relevant quotations and messages to the youths to be distributed. Yeok Boon elaborated on the subject of youth. When Hand of the Cause of God Abu’l-Qásim Faizi came for the South East Regional Youth Conference in December 1968, the Bahá’ís of the College participated in full force. The Technical College Bahá’í Society members were put in charge of the social evenings at the conference. 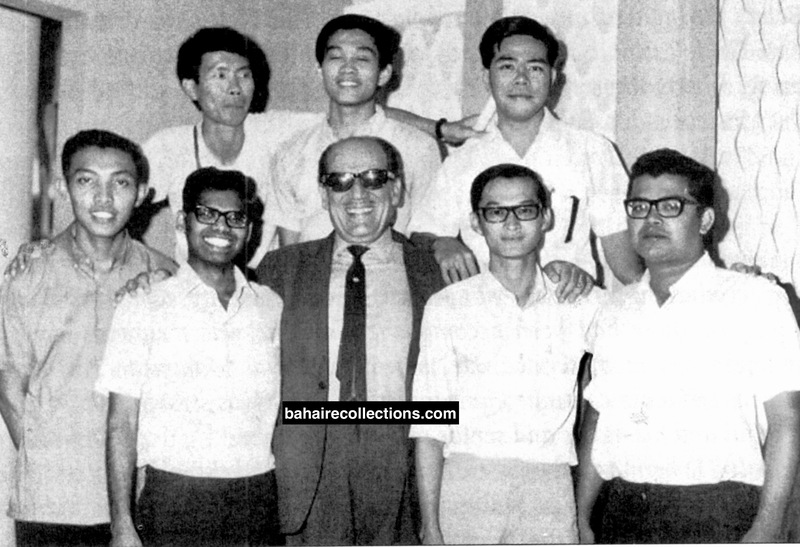 The college believers took a photo with the Hand of the Cause of God and included Yeok Boon even though he was no more with the college as he had been the founder of the Bahá’í Society and had guided them into the Faith. Members of the Technical College Bahá’í Society at the South East Asia Regional Youth Conference, December 1968, Kuala Lumpur. Front row L-R: Yeok Boon, A.P. Arumugam, Hand of the Cause of God A.Q. Faizi, Teh Teik Hoe and Francis Satkunasingam. Back row L-R: Mah Kim Tok, Lim Kee San, and Lye Chye Thiam. By this time Yeok Boon had left the college. Having left the college Yeok Boon was looking for a job. On the advice of his friends, in 1968, he joined the Royal Malaysian Air Force and underwent training at the RMAF Training College in Selangor state. Upon graduating from the College in 1969 he was posted as a Pilot Officer in Labuan Island, just off the coast of Sabah in Borneo. 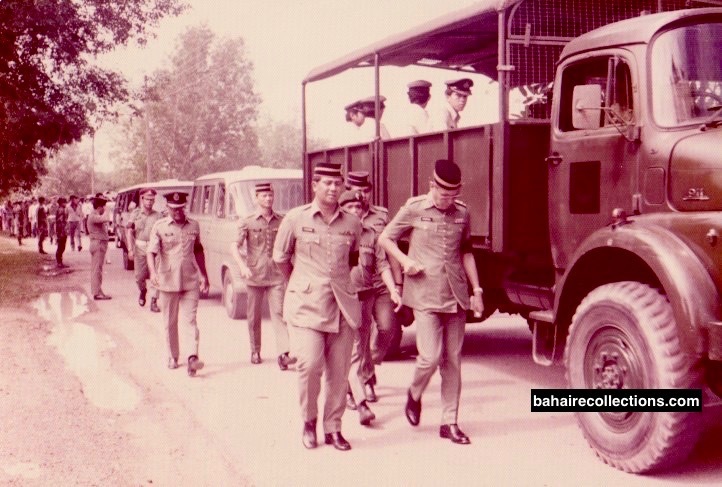 At the end of 1969, Yeok Boon was transferred to Kepala Batas Air Base, north of Alor Setar. His friends in Alor Setar, especially Chong Boo Haw and Teh Teik Hoe would often visit him in the base. At the workplace in the Air Force, Yeok Boon was not willing to compromise his Faith. In the Air Force, alcohol in those days was used frequently by officers for a toast to the king and the country during their official events. Yeok Boon was a devoted Bahá’í and would not compromise his Bahá’í principles. When it came to toasting, he would substitute the alcohol for the Lactogen brand milk. In the officers’ mess, they used to tease him and gave him the nickname “Lactogen Baby.” Yeok Boon was not offended, he took that as a kind of recognition of his principles. He remarked that he consented to be humiliated for the good name of the Faith. He loathed using bad language and even his jokes in private and public were known to be the cleanest. His words and deeds were well respected. He was well guarded in his speech. It was the life that he led that made many of his colleagues and subordinates develop respect for the Faith. He often used to say on his success in his career, “You rise to the need and take care of the Cause of God, and God will take care of your cause, for which I am a living example”. So long as the late Counsellor Inbum Chinniah was alive, he often quoted the life of Yeok Boon on the rewards one gets when offering himself completely for the promotion of the Cause of Bahá’u’lláh. A sing-song session at the Oceanic Conference Singapore, 1971. L-R: R. Ganasa Murthi, Yeok Boon, Jami Subramaniam, Sri Krishnan, Hand of the Cause of God Enoch Olinga, S. Satanam, and Yin Hong Shuen. He got married to Grace Chong of Alor Setar on Thursday, 11 February 1971. That was a very simple and yet dignified wedding. The late Ravichandran, Lily Chinniah and the late Mrs Elizabeth Gibson planned everything for the wedding. Grace made a simple and graceful wedding dress for herself and was accommodated in the house of Mrs Elizabeth Gibson in Setapak for a few days before the wedding. On the wedding day, Pauline DCruz did a good bridal make up for her. Yeok Boon came from the house of Inbum Chinniah and had some Air Force friends with him, all dressed up in Air Force Uniform. Inbum was the able Master of Ceremony. There was no pomp or extravaganza at the wedding. Their wedding was so simple and yet had its own beauty. Photograph taken with friends in a studio after the wedding. A.P.Arumugam and his wife Suguna are at left. Fourth from left is Yin Hong Shuen. Lily Chinniah is next to the bride. To the left of Yeok Boon is Elizabeth Gibson, and to her left is S. Ravichandran. The two flower girls are the daughters of Betty- Zeena to the left and Shirin to the right. 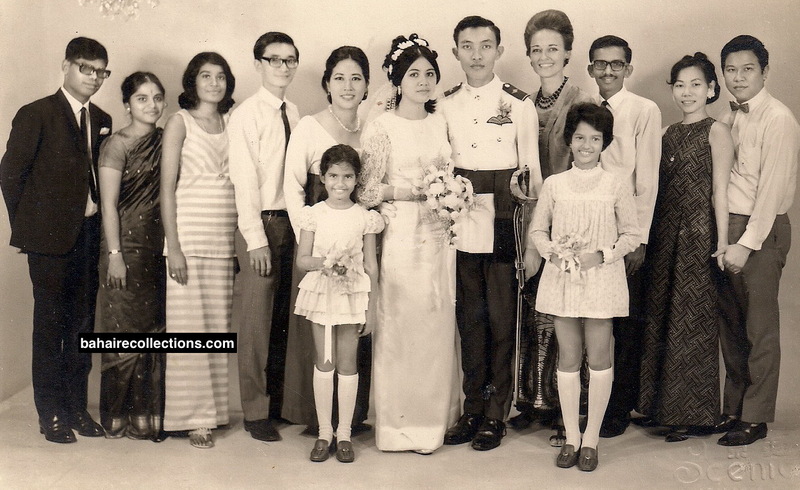 After the wedding, they left for Kuching in Sarawak in 1972. Following his marriage, he made sure his home became a home for all believers, wherever he resided. No visitor to the community he had resided in had left without partaking meals in his house. The guests were always impressed with the kind of warm hospitality he provided. In 1972, he was elected on the first National Spiritual Assembly of the Bahá’ís of East Malaysia and served as its Treasurer. The first National Spiritual Assembly of East Malaysia, 1972. Seated L-R: Yeok Boon, Dr John Fozdar, Rusi Irani and M. Maniam. 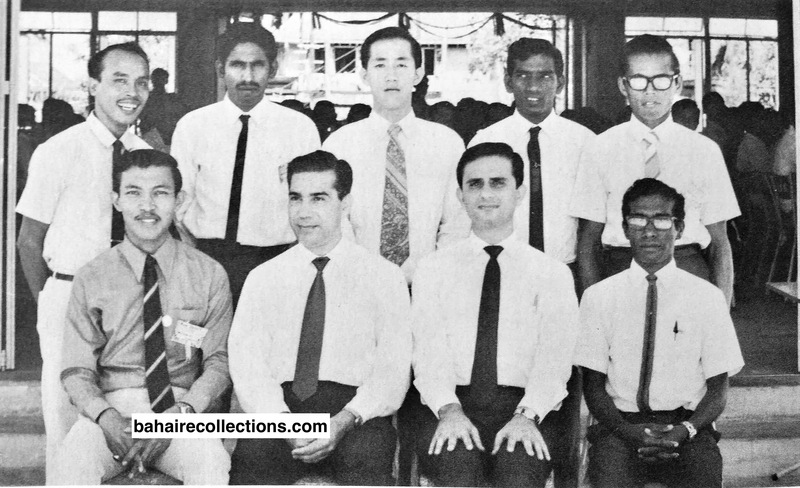 Back row L-R: Ragai ak Lang, Thinathayallam, Lim Boon Huat, Kupppusamy and Sapong ak Andar. He was then transferred to Butterworth in 1973. Yeok Boon served as the Chairman of the Area Teaching Committee of Penang, Province Wellesley, and North Perak when he was stationed in Butterworth and served with great dynamism, often opening his house for the community. While in Butterworth in 1973, his house somehow was open 24 hours. Believers traveling from Alor Setar to Kuala Lumpur for meetings and returning used to drop in at the wee hours. Yeok Boon was always welcoming. Grace was getting accustomed to this lifestyle, albeit with great patience. Yeok Boon had given her all the training in every way possible to make his home a refuge to anyone coming in anytime. Although based in Butterworth, Yeok Boon was actively visiting and participating in Bahá’í activities all over the country – which was only very usual of him. He once again was posted to Sarawak in early 1975. The most unexpected and untimely passing of Yeok Boon on Monday, 26 April 1976 sent shock-waves throughout the community of the Greatest Name. The Air Force planned an operation named “Operation Kota” to send supplies to the soldiers fighting the communists in the jungles of Malaysia in Ulu Muda, Gubir, Kedah, close to the Malaysia-Thailand border. The officer who was to fly the Nuri helicopter had taken sudden leave. That was the time when Yeok Boon happened to be in Kuala Lumpur on another mission and was to return to Kuching in Sarawak. Yeok Boon who had already earned a name for himself as an expert pilot at search and rescue operations volunteered to assist in the mission and he set off with ten other officers to the border area on the Nuri helicopter. As the helicopter was looking for the exact spot where the supplies had to be dropped, the outlawed communists used some sophisticated weapons to shoot at the helicopter. Within seconds the helicopter burst into flames and crashed. This happened around 10:00 am. It was confirmed that all the eleven crew members on the helicopter had died. That was a disaster that Yeok Boon could have avoided, but he died as he lived – always assisting others when he was needed! The tragic news of the helicopter crash was broadcasted both on Radio Malaysia and Television Malaysia. Messages were relayed by telephone calls and in person at a time when e-mail facilities or mobile phones were not available – and very few had landlines. The Air Force swiftly went into action in recovering whatever remains were available and the bodies were returned to the families. In Kuala Lumpur, it was Auxiliary Board Member Inbum Chinniah who first received the news and he himself was shocked and sunk into his seat, unable to bring himself to accept that tragedy. He phoned up friends in Kuala Lumpur and other towns. As soon as the news reached that funeral arrangements were planned at the Sungai Petani Army Base, those who could take leave immediately left for Sungai Petani. The most painful part was informing his wife Grace who was expecting his return to Kuching. Grace was widowed and her daughter Fay was 4 years and 4 months old, Lani Choo just turned 2 and Zena was 8 months old. She and her three children were flown to the army base in Sungai Petani. At the army base, hundreds of Bahá’ís and friends and relatives had already gathered for the funeral- from all over the country. Believers from Alor Star and Sungei Petani came in full force. Isaac DeCruz, who was then the Treasurer of the National Spiritual Assembly of Malaysia, and his wife Pauline were there early. They joined several others in continuously saying prayers. The friends were grieving, not just for Yeok Boon, but for Grace as well and her small children who were seated on the floor around the coffin. Counselor Vicente Samaniego who happened to be in the region was brought to the army base by Chong Boo Haw of Alor Setar. The coffin that contained the remains of Yeok Boon was sealed completely and placed in a central place for all to view. By this time Colonel Dr Gopinath of the Royal Malaysian Air Force was flown in from Kuala Lumpur to inspect the bodies, for the purpose of preparing a report. The Colonel was not a Bahá’í at that time. He accepted the Faith in 1980 and served on the National Spiritual Assembly of the Bahá’ís of Malaysia and as Director General of the Bahá’í House of Worship in India. On the morning of Wednesday, 28 April 1976, the army hearse transported the body to the graveyard at the end of the army camp, with full military honours. All the friends and relatives walked to the burial site. I was walking with a group of believers from Alor Setar. M.S. Maniam from Alor Setar remarked with a heavy heart, “Yeok Boon’s passing is most unexpected. Nobody can predict the future. I am driving to Kuala Lumpur next week to attend the Convention. Anything may happen to me too. This is life and Bahá’u’lláh has said death may come unheralded upon anyone. We have to accept it.” The remains of Captain Choo Yeok Boon were laid to rest according to Bahá’í rites at the army base. The Bahá’í funeral service was conducted by Mr S. Nagaratnam. A reporter from the government-run television news station recorded the event and rushed to the Penang International Airport to get the news covered by the evening news. This had been a tragedy of massive proportions in the annals of the Air Force and so it was hugely newsworthy but a heart-rendingly sad and painful occasion for all the families and the nation. Remains of Captain Choo Yeok Boon being transported to the burial site in the Army camp, with full military honours. 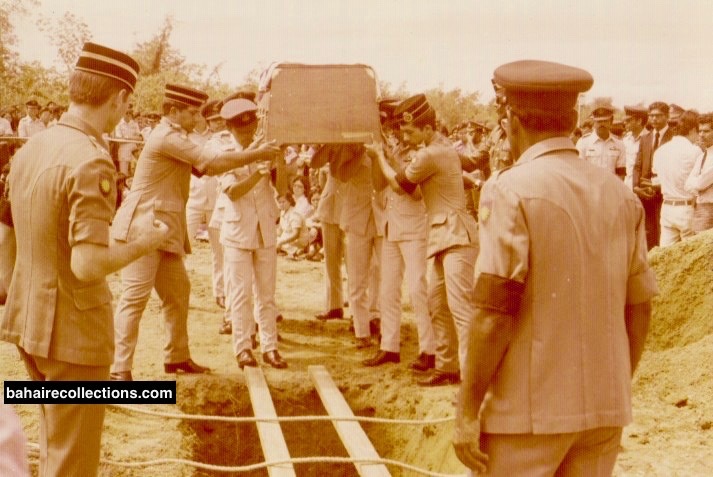 The coffin bearing the remains of Captain Choo Yeok Boon is being lowered into the grave by army officers. Mr Nagaratnam is seen at left. Standing at extreme right with folded arms is Isaac DCruz. “This Day in History” program that was broadcasted later by Radio Television Malaysia (RTM) in the Malay language. 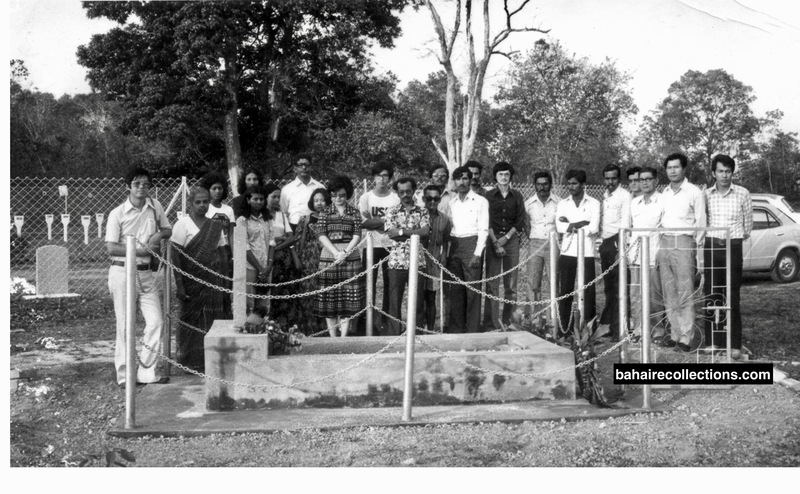 That was the first Bahá’í funeral to have taken place in any army camp in the history of Malaysia. At the time of his untimely passing, Yeok Boon was a Captain in the Air Force and a member of the Spiritual Assembly of the Bahá’ís of Malaysia. On Friday, 11 December 2015- the date that marked Yeok Boon’s birth – his remains were exhumed and reburied with full military honors in the Bahá’í Cemetery within the Nirvana Memorial Park in Sungai Petani, Kedah. Some believers from Alor Setar and Sungei Petani visiting the resting place of Yeok Boon to offer prayers. Yeok Boon has posthumously conferred upon the “Pingat Gagah Berani (PGB)” medallion, the second highest bravery award by the Federal Government of Malaysia. His illumined photograph describing his sacrifice for the country was placed in the Malaysian Museum for some months. When his untimely passing was reported to Hand of the Cause of God Dr Raḥmatu’lláh Muhájir who met a group of believers in Merlin Hotel during his visit to Kuala Lumpur in May 1976, he evinced deep sorrow and said, “Boon had grown too fast and was wanted in the next world.” He then urged the believers to emulate Yeok Boon in the teaching field. He passed away during the Ridván period and a special memorial session was held during the National Convention. When S. Nagaratnam, Dr John Fozdar, Francis Singam, Chong Boo Haw and Yin Hong Shuen spoke of this true servant of Bahá’u’lláh, many sobbed profusely. S. Nagaratnam had mentioned, “In life, Boon did great things, in death he does even greater things.” Dr John Fozdar, Chairman of the National Spiritual Assembly of the Bahá’ís of Malaysia, gave a moving talk on Yeok Boon whom he had known well. His humility and friendliness overcame all claims of rank. He was the most friendly and hospitable. Bahá’ís will remember ‘Abdu’l-Bahá’s exhortation in the Marriage Tablet, “to make your home a rose garden of love and harmony.” Yeok Boon’s home was such and he attracted many friends without any restrictions around the clock. One of his Royal Malaysian Air Force colleagues relate how, having nowhere to stay in town, he hoped to find hospitality in Yeok Boon’s home. He was dismayed that others had neglected him. As he related, “They were stacked up to the roof.” Bahá’u’lláh has written that charity and generosity are dear to God. Yeok Boon was one of those who did not let his right hand know what his left hand gave. He had an old car, so old that his friends know by the trailing exhaust pipe that Yeok Boon was visiting them. If Yeok Boon came to the house in a friend’s car, we usually know that the car had broken down by the roadside. Everyone joked about his car. What no one realized was that Yeok Boon had raised all the money he could by loans and savings and given it to the Bahá’í Fund to redeem a pledge and could not find more money for his own comfort. But he never told his friends who laughed at his car and he never ever complained. In Kuching, when we heard the news about his death, all eyes had tears –old and young friends at this tragic loss. His circle of friends and admirers was large and on one Bahá’í New Year, hundreds visited his home to join in celebrating. Our hearts go out to his aged mother. What a heavy blow, to rear her only son with such devotion and to lose him so tragically in the prime of life; in the full possession of all his powers and with a bright and hopeful future ahead of him. We pray that God will heal the wound to her sorrowing heart. What soothing words can we say to his young and faithful wife – what solace can we offer to his innocent children? All that our bonds of brotherhood and loyalty can offer are for them to command. We loved her husband and their father, and we shall try and cover them with the love and loyalty that he would have wished. ‘Abdu’l-Bahá tells us that “God is the Divine Gardener.” A gardener knows when the plant in the pot needs to be transplanted into the ground. The gardener breaks the pot and transplants the plant. To the plant, it may seem like death, but the gardener is more knowing and he knows the plant could not develop more in that narrow, restricted space. God is our Divine Gardener. He knows when the soul has reached his maximum development in the body and He transplants the soul into richer and more fertile soil. We have that faith. As Dr John very rightly pointed out the time had come for the plant to be transplanted. When Yeok Boon came for a meeting of the National Spiritual Assembly in the National Bahá’í Center in Kuala Lumpur, just days before he passed away, he was completely a different person altogether. The night before the meeting started Yeok Boon was standing outside the Bahá’í Center and staring into the sky. R. Ganasa Murthi who also served on the National Spiritual Assembly approached Yeok Boon and asked him what he was looking at. Yeok Boon replied, “Look at the greatness of Bahá’u’lláh. He has created the universe with such a beauty…. I want to become detached and saintly….” Ganasa Murthi saw a different tone in his reply and felt that Boon’s words had some kind of message, which he could not figure out there and then. It was only after his passing that Ganasa Murthi shared this incident with a few of us. He was dearly and really missed and the pain was felt for a long time, especially by those who moved very closely with him. At the South East Asia Regional Conference held in Port Dickson in December 1976, Yin Hong Shuen was addressing the conference on the services rendered by early believers. He said, “We had so many great youths in our community such as Choo Yeok Boon..” As he mentioned the name of Choo Yeok Boon he broke down, and could not proceed with his speech. The 1,200 over friends started to chant Allah-u-Abha, and after some time Yin Hong Shuen was able to compose himself and continue his speech. Yeok Boon was outwardly seen as a soft-spoken person, full of humility. But he never relented in defending the Cause whenever he had to. When pushed to the corner, he often had roared like a lion in defense of the Cause, both in the Technical College and his working place. And he was sporting at Bahá’í social functions. In December 1971, a Unity Feast was held at the Furlong House in front of the National Bahá’í Center, on the eve of the National Youth Conference. Yeok Boon was called to take the floor to lead the friends in a sing-song session. He started with the song “Meet me tonight under the moonlight” and went on with a few more songs in a row that set all the friends alight. Several friends remarked that Yeok Boon could bring about the difference at any gathering. During the first Winter School held in December 1972 in Johore Bahru, a play named “Julius Caesar Becomes a Bahá’í” was staged. A. Govindasamy who wrote the script was looking for a Bahá’í lady to play the character of Cleopatra. As he could not get any Bahá’í lady at the Winter School to play that role, he approached Yeok Boon and he immediately agreed and dressed up as Cleopatra. As the play progressed Yeok Boon’s appearance as Cleopatra caused so much amusement, and he stole the entire show. Although Yeok Boon rose to the position of Captain in the Royal Air Force which provided perks and good official residence, there were no airs about him. He opened his home, just as his heart, to everyone. He always remembered his roots and welcomed both the believers from urban settings and the aboriginal believers to his home and provided the best hospitality to them. He had a sister who had to sell cakes to educate him and an aged mother who cared for him. Yeok Boon made sure they were able to taste some comfort the moment he was well placed in life. Yeok Boon was by nature a very generous person. There were times when he sacrificed his comfort for others who were needier. 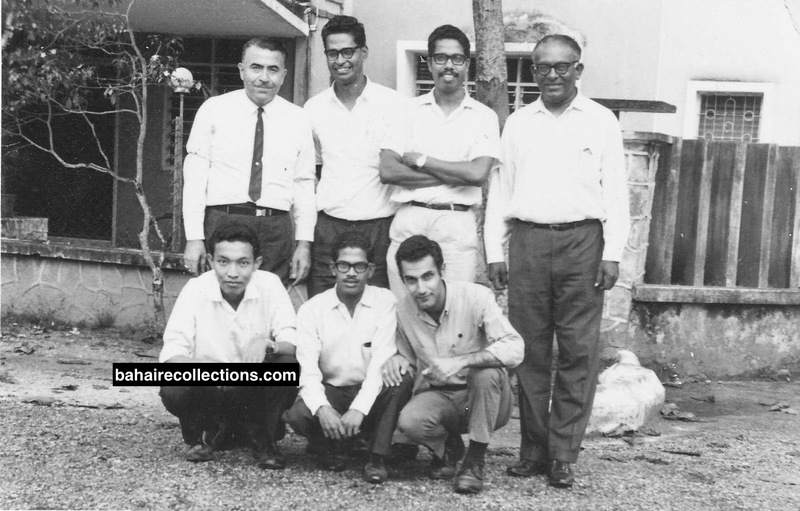 In 1968, Kanagaratnam who was a member of the staff in the National Bahá’í Center, and Srepathy from Seremban were making trips into the jungles of South Perak to teach the Faith to the aboriginal people. They had to get up at dawn to catch the first bus to Sungkai and Bidor town from where they had to walk into the jungles. Yeok Boon who frequented the National Bahá’í Center saw their difficulties and offered his Lambretta motor vehicle. That was the only vehicle Yeok Boon had. And after that Yeok Boon, himself used public transport to visit the National Bahá’í Center. Kanagaratnam and Srepathy were able to make full use of the Lambretta, until one day it got stolen. They informed Yeok Boon of the theft, and he smiled it off, saying these things do happen. He naturally and spontaneously looked out for youths with no means to attend Bahá’í functions or those unemployed. Unasked he would slip some money into their pockets. Yeok Boon will always be remembered in the history of Malaysia as a youth of spotless character, whose dressing was an example to the rich and consolation to the poor. He was indeed a perfect guide for the youth. Yeok Boon was always a great guide and inspiration to the youth of his time. In 1973, I happened to be at a 19-Day Feast in Butterworth. Yeok Boon came up dressed in long sleeve batik shirt and was very presentable. There was a youth who came for the same feast in short pants after a football game, sweating. During the consultation part of the Feast, Yeok Boon very diplomatically sent a cardinal message to the youth. He said that he admired the Christian people who used to get up so early on Sunday mornings to go for Church and dressed up in their best. He next pointed out that Bahá’ís are required to come for the Feasts only once in 19 days and that too in the evenings. Yeok Boon said we too should try to come in the best for the Feasts. He also spoke on another matter of great importance at the same Feast. Yeok Boon and said, that in order to be successful in our marriage our youthful days should be spent in a chaste and holy life. His radiant nature affected many. During his time as a youth, Yeok Boon came to be singled out as a person of spotless character who led a chaste and holy life. As time passed by even his closest friends developed so much respect for Yeok Boon that they even started to call him an angel and saint. In the last two years of his earthly life Yeok Boon was seen to be a completely different person, detaching himself from the world and discussing heavenly matters. At one of the deepening sessions that Inbum Chiniah conducted, the subject of Yeok Boon’s passing came up. Inbum had this to say, “Yeok Boon was always clean in his thoughts, deeds, and actions. Not once had I heard him utter an unwanted word. He loved jokes, and his jokes were always clean. He was among the spotless believers I had met”. In his death, the Malaysian community had lost a true gem given to them by the wondrous hand of Bahá’u’lláh. During his short twelve years of Bahá’í life, he rendered inestimable and distinctive services, yet to be rivaled by any other youth of his day. He made the Faith proud in the eyes of the Malaysian government by sacrificing his own life for the nation. Yeok Boon is a rare kind of believer gifted by Bahá’u’lláh to the community of the Greatest Name in Malaysia. 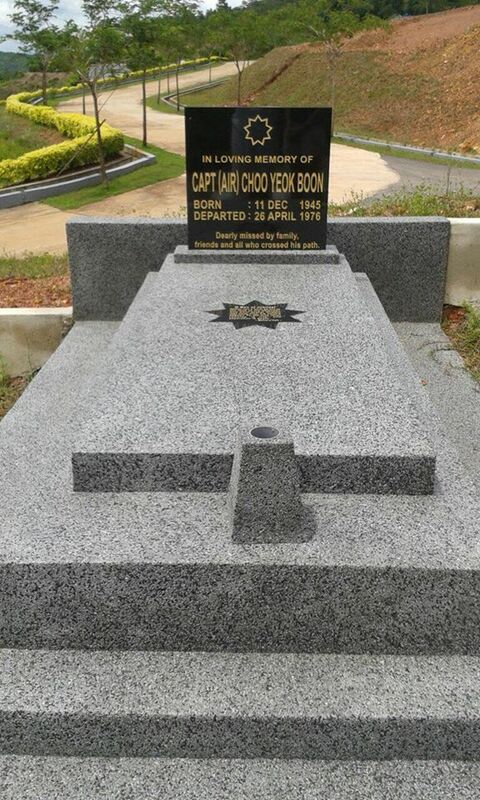 The final resting place of Captain Choo Yeok Boon at the Nirwana Memorial Park, Sungai Petani.